Your PC must be this powerful to run Civilisation VI. 2K has revealed the modest minimum and equally modest recommended specs. 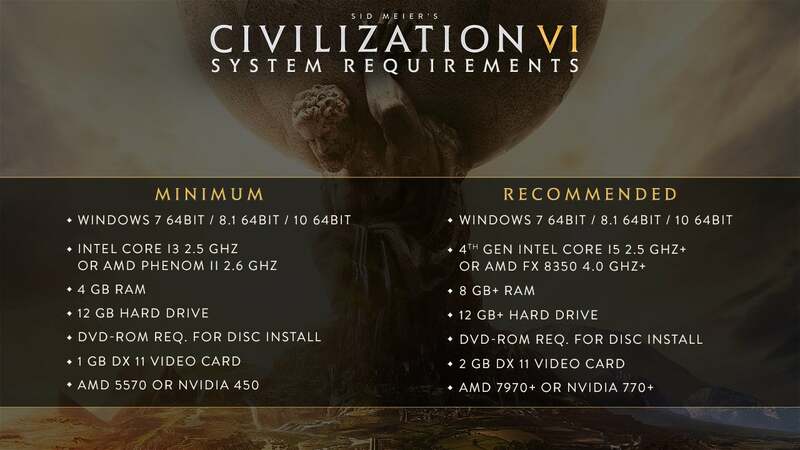 Not shown are the maximum specs, as some fool would try to top them and get us all killed. I have a 740, which is on par with a 920 anyway. I might not be able to have shiny sea reflections, but it will run well enough for me. 5 year old PC still nailing it *pats beastlet* Puur my kitty, purrrrr. I am running an EVGA GTX 580 though so that will be the slow point I think? How you reckon it would fair on a laptop's gtx 960? Should be decent. Civ5 ran fine on max on my old laptop with same card.